The National Gallery. Mary Ann Hoggins to Amelia Hodge. William S. Brunton (fl. 1859-71), artist. Fun 7 n.s. (4 April 1868): 38. 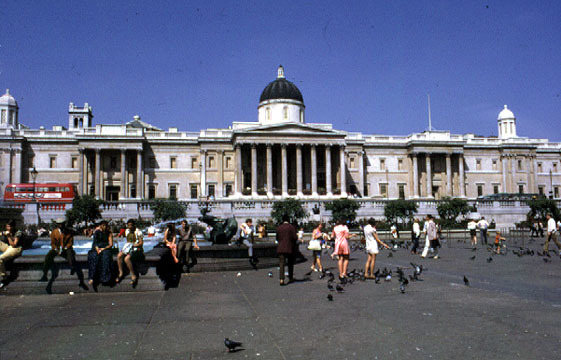 Click on image to enlarge it and see commentary below the photograph of the National Gallery. This comes hopining to find you as it leave me at presant, and why you should keep a-stickin’ down in that precious dull place of a Pogely Regis when there's places as misses is cryin' their eyes out for to get survents in London is to me nothink but americal. Not but what places here, except where you git into a fam'ly where a footman is kep', is but a life little better than a black neger, as I always says service is no inhenrytense, but Sam, he says, “Wait a bit,” and w'en his aunt dies as he shall go into a public house if not tho general line, which his callin' now is a animnl purweys, better known as cat's meat, and a good ready money conexion, with ten lb. in the Post off his Savin's bank. What made me begin about Samuel I don't hardly no, 'xcept as it wna yesterday my day out and we on that akount met, at least I waited for him at the yousual place as is where I should ha' told you of before; a great building known as tho Natural Gallery: and so, as I always says to Sam, a good name too for them as is sitiwated like us. Not out what its tegus a-settin' there on them cane-bottomed forms, as seems somehow net to be made for to give comfort and nothink to look at but a parcel o' picters on the walls, and yet, lor’ bless you, the skores as came there to stare at 'em when it's a bright day enuf to see whatever they're about, which I must say as yesterday were one of tho loveliest days as even the Natural Gallery itself couldn't look to say dull, and I jest took a glance round as I knew I was ten minits too early for Sam. I was glad as Sam come in when he did, for not sein' no prices put on the picters, I asked a elderly person as was a-lookin' at one, making his double fist into a telescope, as I thought was his playful ways, how much he thought as would be asked for the feller to it, which one on ’em was a portrick of a young woman and the other of a young man, as having a few more things on than a-many as was there, I thought becomin', and what do you think that old’party said, hut that them picters had coat thousands to the nation, which the Government had bought ’em cheap at that. I looked at him scornful, as haven't been away from the country to be took in like that, and says, “You ought to know better, at your time o' life, to give yourself to such a falsity. As,” I says, “I may be countrybread, but I’ve seen a-many better down the City-road as might be had frame and all," I says, “for eleven or twelve shillin's; and I shouldn't mind goin’ to thirteen if they'd part 'em, which the young woman is a bold-faced pig, as I wouldn't hang her likeness in no room of mino." Mary Ann Hoggins, the letter writer here, is not the middle (or lower middle) class Mary Anne Hodgkinson who has come from the country to see London in A Visit to Cremone. According to the online Urban Dictionary, a Mary Anne is the name for a “person that wears her heart on her sleeve to help others,” but the Mary Ann(e)s who appear in this series of Fun cartoons are naive, ignorant speakers, and the Mary Ann of this cartoon’s casual racism and arrogant ignorance exemplifies both the worst of Victorian class-based humor and the qualities it satirizes. Fun’s cartoons about servants often base their comedy on their ignorance, as in the one in which Bridget, the young woman from Ireland, tells an author that she has used his manuscript to start a fire, reassuring her horrified employer, “Oh, Sor, only just the old ’uns that were scribbled all over! Sure I haven’t touched the Clane Paper at all at all!” Much class-based humor mocks the working person’s ignorance of high culture, and in this letter from a maid describing her day off when she meets her beau, Samuel, at the National Gallery the young woman mistakes the museum for a shop. Given that this cartoon appeared not long after the Reform Act of 1867, which led Matthew Arnold, John Ruskin, and others attempt to raise the cultural level of the new voters, this cartoon could be taken either to satirize such educational programs or show the drastic need for them. 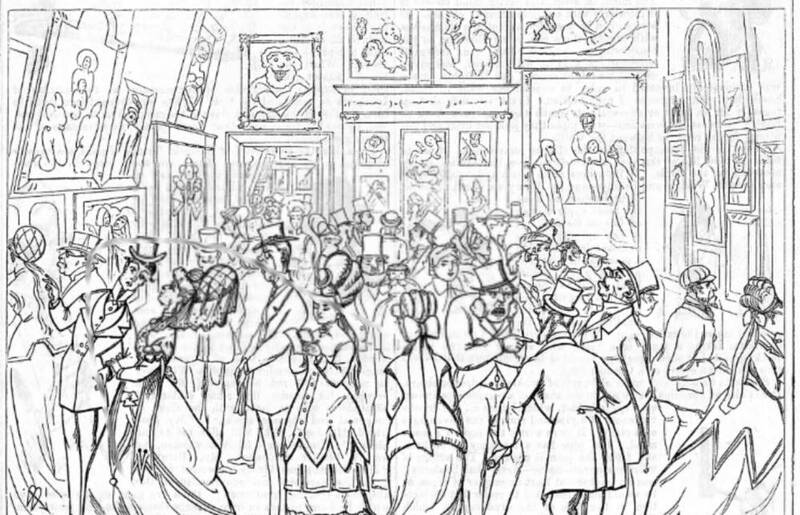 Like the text accompanying Fun’s cartoon about the British Museum, this one tells us that courting couples used museums for assignations, if one may use so grand a word. Note, too, that the letter closes with comments on a servant’s access to candles, something employers didn’t always allow. As Marilyn Palmer and Ian West explains: “The high cost of candles meant that their use by servants was strictly controlled. Lower servants, at least, were generally not allowed them in their bedrooms, partly for reasons of fire safety and partly to discourage them from reading. To light their way to bed they therefore had to steal the stub ends of candles, for which there was much competition, as butlers and footmen often regarded these as a ‘perk’, to be sold back to local merchants” (75). Palmer, Marilyn, and Ian West. Technology and the Country House.. Swindon: National Trust and Historic England, 2016.